This Post is sponsored by Crock-Pot® Brand, but all opinions are mine alone. 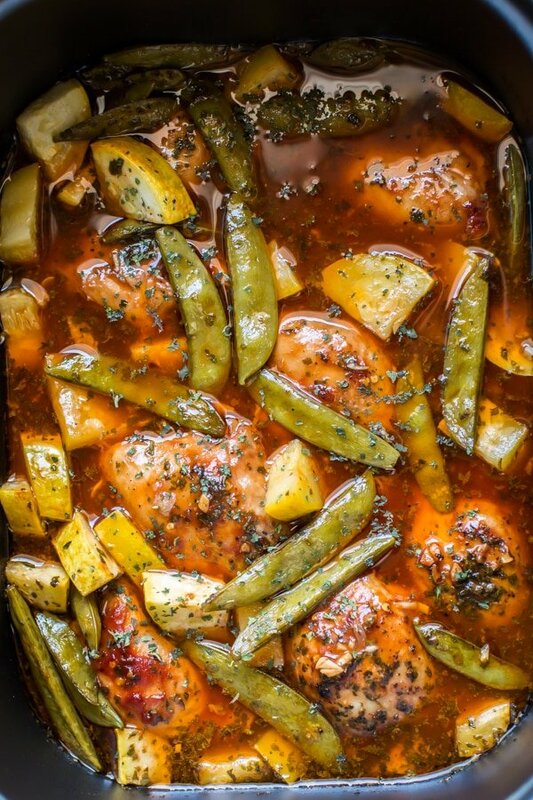 This Slow Cooker Sweet and Spicy Chicken with Veggies is a delicious meal that your family will love! I have been adding slow cooker recipes to my blog for almost 4 years now! If you have been following along with me, you may know my favorite slow cooker to use is the Crock-Pot® Brand. It’s my favorite brand because it cooks evenly and predictably, unlike other brands I have tried. Also this brand is top quality, it is an appliance that I have pride to showcase in my kitchen and take to parties. 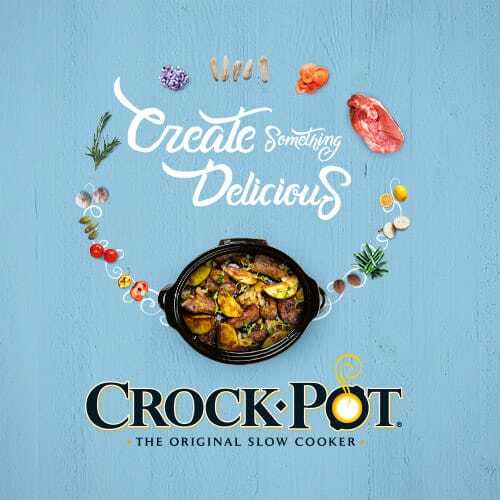 Did you know that the Crock-Pot® Brand website also has many recipes too? You can see them here. I have a wonderful back to school recipe for you today. My little one is back in school starting 1st grade! It’s that time of year that I start thinking of creative new dinners for the family, so we don’t end up dreading the same ole’ recipes. 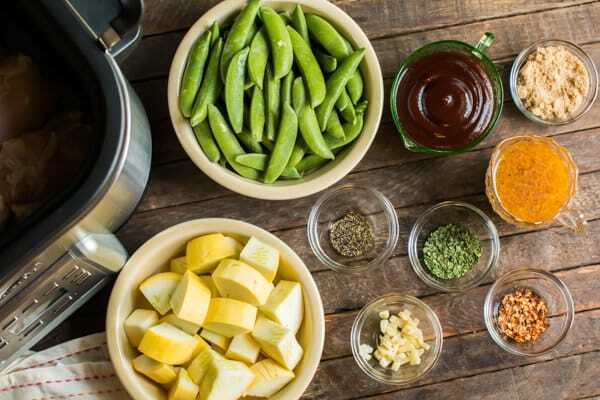 That is what I love about my Crock-Pot® Slow Cooker, that I can get easily get creative with fresh ingredients and seasonings, then the Crock-Pot® Slow Cooker does the work by melding the flavors together while it cooks. 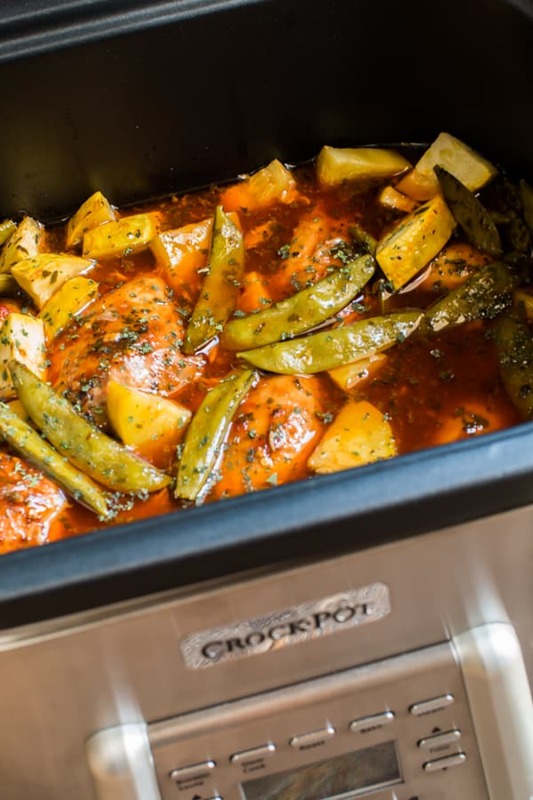 With this recipe I am trying out a new slow cooker from Crock-Pot® brand. It’s a 6-quart 5-in-1 multi-cooker. It has a non-stick inner pot! The best part for me is that I can brown meat directly in the insert with the device, no more extra pan to wash! It also has rack for steaming foods. 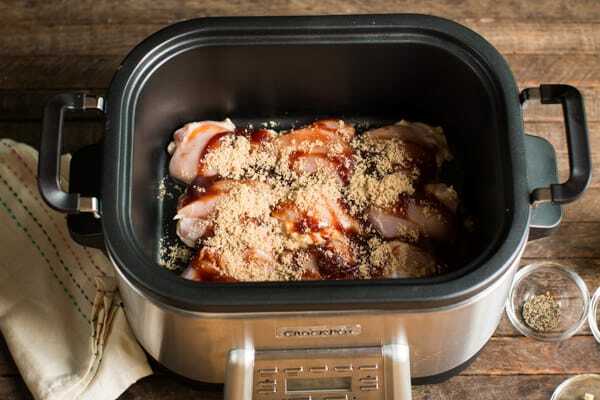 This Crock-Pot® 5-in-1 Multicooker also has a roast option and bake option. Of course it has the slow cook function that I use most. 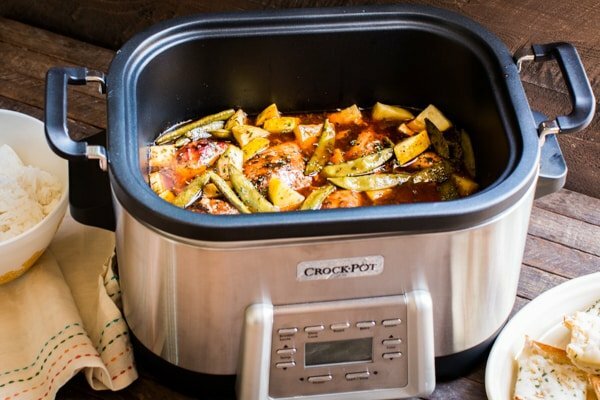 This recipe for Slow Cooker Sweet and Spicy Chicken with Veggies has fresh ingredients, also it has a few pantry items you may already have on hand. I came up with this recipe by converting a grilled chicken recipe of mine that we use during the summer. 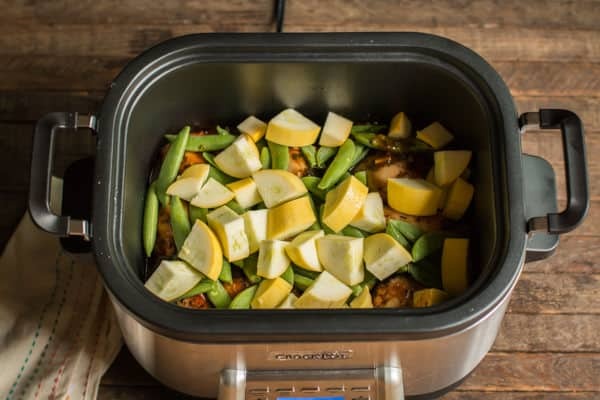 What I love about using my slow cooker instead of the grill is that meat gets more tender and I can add veggies right on top of the chicken in the slow cooker at the end of the cooking time. I start by laying down the chicken thighs in the slow cooker. Boneless skinless chicken thighs are my favorite cut of chicken. It stays juicy and isn’t too fatty since it is skinless. Then I spread over barbecue sauce and brown sugar over the chicken. Use your favorite barbecue sauce! On top of the barbecue sauce and brown sugar, I add black pepper, red pepper flakes, garlic, and dried cilantro. You can use fresh cilantro if you have it, use what you have on hand. I have been using a lot dried cilantro in my cooking since I discovered it at the store, for me fresh cilantro doesn’t last long in my fridge. Then I pour over Italian dressing. I cook this for 4 hours on high. When the 4 hours is up, I add the sugar snap peas and sliced yellow squash. I cover the slow cooker once again and cook for an additional hour to get the vegetables tender. Below is what the meal looks like after the cooking time is done. The sauce flavors are melded together from the slow cooking and the chicken and veggies are perfectly tender. This is pretty much a complete meal! I like to serve this Sweet and Spicy Chicken with Veggies on steamed rice (white or brown rice are both good with this!) and garlic bread on the side. 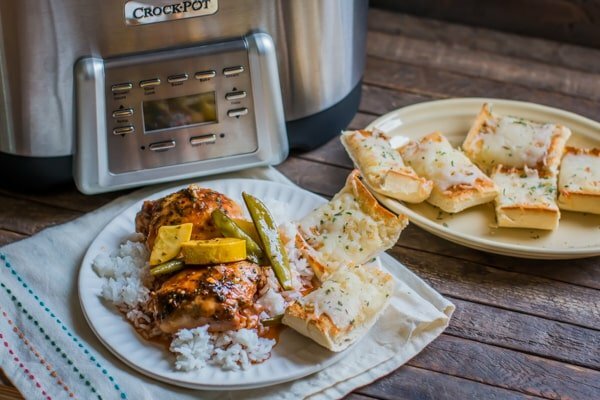 What I also noticed about this Crock-Pot® 5-in-1 Multicooker is that is gorgeous. If you are like me and slow cook often, you leave your slow cooker on the counter. This by far is my best looking slow cooker. I had a different Multicooker from another brand, it was so big and clunky that I had to hide it away. I actually got rid of that other brand multicooker at a garage sale after getting this beauty. My family loved this meal! It was something different than our weekly spaghetti or sloppy joes, it’s fun to switch things up. Also, the leftovers taste great my husband said! Here is a video on how to put this meal together! 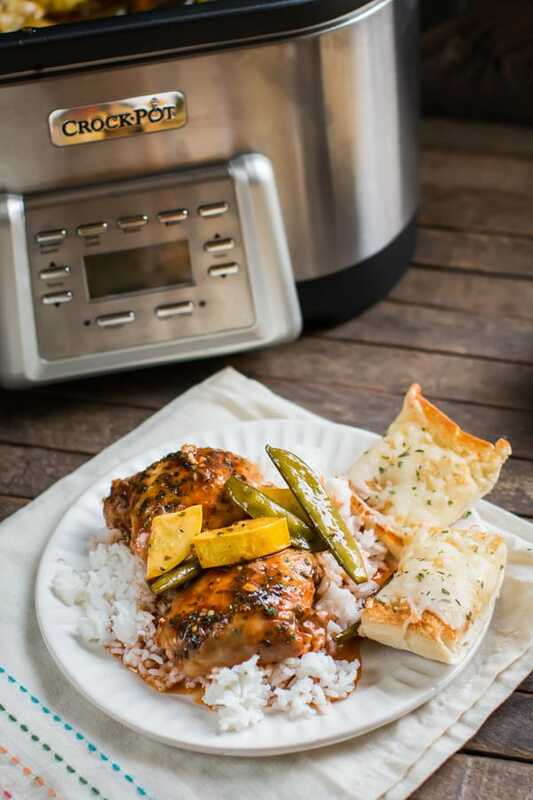 I hope this recipe inspires you to create something new in your Crock-Pot® slow cooker! You can find many more great recipes over at the Crock-Pot® Brand website. 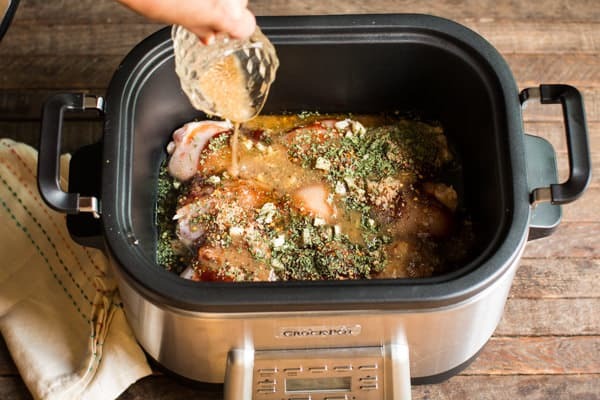 Start by laying the chicken thighs in the bottom of the slow cooker. Spread over the barbecue sauce. Sprinkle over the brown sugar, red pepper flakes, black pepper, garlic and cilantro over the chicken and barbecue sauce. Pour over the Italian dressing. Cover and cook on HIGH for 4 hours. Don't open the lid during the cooking time. After the cooking time is up. Add the sugar snap peas and squash. Cover the slow cooker again, and cook for an additional hour on HIGH. Hi Sarah my wife has an egg allergy and a lot of your recipes are chicken do you gave any beef or pork recipe? This looks really good, but I think (for my personal taste) an onion quartered in with the other veggies would be an ideal addition. Onions would be a great addition! This looks amazing! Must try soon!!!! Thanks Deborah! Let me know how you like it! I was wondering about the chicken breasts as well? I would like to use both. Also, if you used the new crockpot that browned the meat, should we brown the meat in advance? This is legit one of the best slow cooker meals I’ve ever come across. Thank you! Hi! 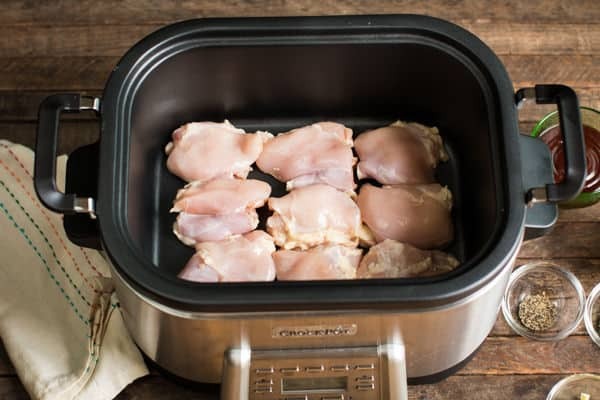 Would this be possible to make using the instant pot?